Join us for a reading group discussion of Timescape by Gregory Benford! The author of Tides of Light offers his Nebula Award-winning SF classic--a combination of hard science, bold speculation, and human drama. In the year 1998, a group of scientists works desperately to communicate with the scientists of 1962, warning of an ecological disaster that will destroy the oceans in the future--if it is not averted in the past. In addition to being a Nebula Award-winning author, Greg is a physics professor and a poet. 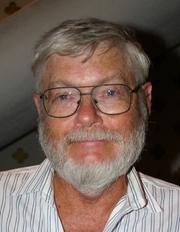 Larry has won multiple awards in the Speculative Fiction Field, including the Hugo and Nebula. Join us to discuss science fact and science fiction with Greg and Larry. The February 19 discussion invites readers to travel to the future of the past, with Gregory Benford’s Timescape. Bowl of Heaven is the first collaborative work by SF luminaries Gregory Benford and Larry Niven, to be followed by Shipstar. (See Patrick’s review.) In addition to being a Nebula Award-winning author, Greg is a physics professor and a poet. Larry has won multiple awards in the Speculative Fiction Field, including the Hugo and Nebula, and recently collaborated on Known Space / Ringworld novel Fate of Worlds with Edward Lerner. Join us and guest host David Brin to discuss science fact and science fiction with Greg and Larry. Greg and Larry are also signing in Redondo Beach on October 18th. Gregory Benford is currently considered a "single author." If one or more works are by a distinct, homonymous authors, go ahead and split the author. Gregory Benford is composed of 19 names. You can examine and separate out names.